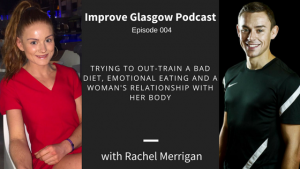 Episode 004 of the Improve Glasgow Podcast is LIVE! In this episode Ross Stewart sits down with fellow Improve Glasgow coach Rachel Merrigan to talk about obsessive and excessive training habits and the phenomenon of trying to out-train a bad diet. They chat about how emotions are linked to eating habits, women’s relationship with their bodies and how that effects their dietary choices. They also cover overdoing things at the weekend and how to prevent this from happening.